I am at the crossroad thinking should I refer to Lawrence of Arabia or Rain Man movie in this article. As I am preparing to conclude my first career in HR (spanned for over three decades) and open the second career from 1st September 2018, I must write about my recent experience when I attended a Storytelling workshop (conducted by none other than the legendary, Geeta Ramanuja of KATHALAYA, Bangalore) which demonstrated that face-to-face telling of an apt story to the right audience at the right time and in the right way can transport the listeners from one end to the desired end and reset the story teller’s success trajectory. I am at the crossroad…thinking should I refer to Lawrence of Arabia or Rain Man movie in this article. Lawrence of Arabia (film was released in 1962/Box office $70 million and it was nominated for ten Oscars at the 35th Academy Awards in 1963; it won seven in total: Best Picture, Best Director, Best Original Score, Best Cinematography (Color), Best Art Direction (Color), Best Film Editing and Best Sound Mixing. It also won the Golden Globe Award for Best Motion Picture - Drama etc. Rain Man (film was released in 1988/Box office: $52 million and won Academy Awards for Best Picture, Best Actor in a Leading Role -Dustin Hoffman, Best Director and Best Writing, Original Screenplay. It was nominated for Best Art Direction, Best Cinematography (John Seale), Best Film Editing, etc. A difficult call, but I decided to go ahead with Rain Man. Why so? How this movie is connected to HR / HR values. Let me say little about Rain Man…an individual of exceptional intelligence whose mental capacity far surpasses average Joe or even highly intelligent Joe. The story of the film goes like this… Los Angeles based automobile dealer Charlie Babbitt (Tom Cruise) is a selfish man. When his estranged father leaves the bulk of his fortunes to someone else, Charlie learns that the person is none other than his reclusive (an autistic person) brother Raymond (Dustin Hoffman). Raymond (Dustin Hoffman), is "high-level" autistic. He can carry on conversations, stick to a schedule, compile baseball statistics, memorize dinner menus and become disturbed when anything upsets his routine. He can also count 46 spilled toothpicks in an instant and calculate square roots in a flash. But what he is thinking? There is a moment in "Rain Man" that crystalizes all the frustrations that Charlie feels about Raymond, a moment when he cries out, "I know there has to be somebody inside there!" But who? And where? "Rain Man" is so fascinating because it refuses to supply those questions with sentimental but unrealistic answers. 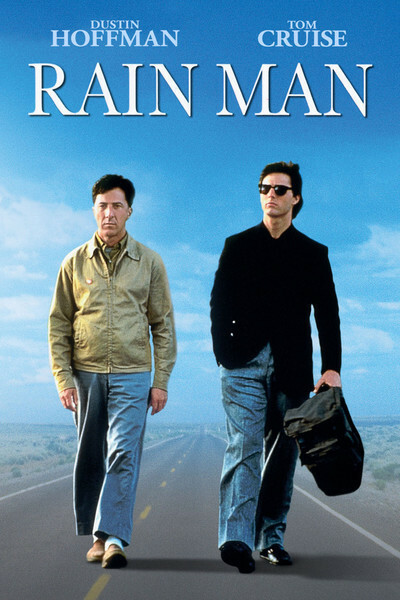 "Rain Man" works so well within Raymond's limitations because it is a movie about limitations, particularly Charlie's own limited ability to love those in his life, or to see things from their point of view. As the film opens, we see Charlie frantically trying to juggle his way out of a crisis in his Los Angeles business, which seems to consist of selling expensive imported automobiles out of his hip pocket. He is driven, unhappy, a workaholic. One day he receives word that his father - a man with whom he has had no contact for years - has died back East. At the reading of the will, he learns that he has received a pittance (including a prized 1949 Buick Roadmaster), and that his father's $3 million fortune has gone into a trust. Who is the trust for? Performing some amateur detective work, Charlie discovers with a shock that it goes to support an older brother he never knew he had - an autistic brother who has been institutionalized for years. Visiting Raymond at the home where he lives, Charlie finds a methodical, mechanical, flat-voiced middle-age man who "definitely" knows things, such as that tapioca pudding is "definitely" on the menu, and that his favorite TV program is "definitely" about to come on the air. "Rain Man" follows this discovery with a storyline that is as old as the hills. Angry that he has been cut out of his share of the inheritance, Charlie takes Raymond out of the mental home and vows to bring him to live in California. But Raymond will not fly (he "definitely" recites the dates and fatalities of every airline's most recent crash). And Charlie puts Raymond in the front seat of the 1949 Buick and they head out on a cross-country odyssey of discovery. Everything changes in the movie except for Raymond. In a roadside diner somewhere along the way, he still stubbornly insists on the routines of the dining room in his mental institution: The maple syrup is "definitely" supposed to be on the table before the pancakes come. Charlie at first does not quite seem to accept the dimensions of Raymond's world and grows frustrated at what looks like almost will full intractability. Eventually, toward the end of the journey, he finds that he loves his brother, and that love involves accepting him exactly as he is. He/Raymond does not play cute, or lovable, or pathetic. He is matter-of-fact, straight down the middle, uninflected, unmoved, uncomprehending in all of his scenes - except when his routine is disrupted, when he grows disturbed until it is restored. The changes in the movie all belong to Charlie, who begins the film as a me-first materialist, a would-be Hero without a line of credit. By the end of the film Charlie has learned how to pay attention, how to listen and how to be at least a little patient some of the time. He does not undergo a spiritual transformation; he simply gets in touch with things that are more important than selling cars. Charlie loved him for what Raymond was, not for what he was not, or could not be. By the end of "Rain Man," what have we picked up through this story? The film is about ACCEPTANCE. Charlie Babbitt's first appearance in the movie has him wheeling and dealing in the face of imminent ruin, trying to control his life and the lives of others by blind, arrogant willpower. What Raymond teaches him/Charlie is that he can relax, because try as he might, he will always be powerless over other people. They will do just about what they choose to do, no matter how loud Charlie Babbitt screams. Raymond has a lot he can teach Charlie about acceptance, even if it is the solitary thing he knows. 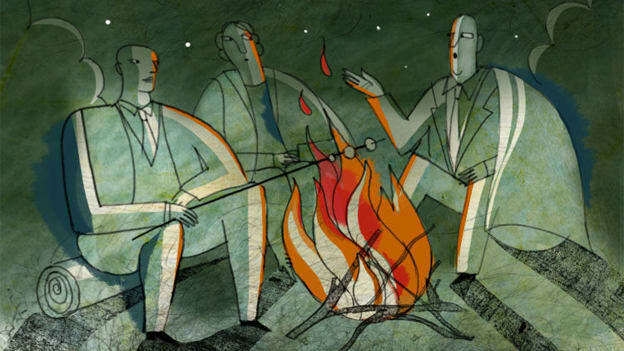 Non- stories may provide information, but stories have a unique power to move people’s hearts, minds, feet and wallets in the story teller’s intended direction. This is true even in a business context. Think about it! Praveen Sinha is the Associate President- Corporate HR at Escorts Limited.